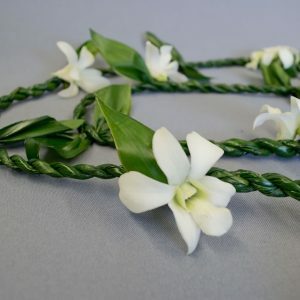 The Song-of-India lei is an unusual yellow and green flat lei braided in the Micronesian tradition. 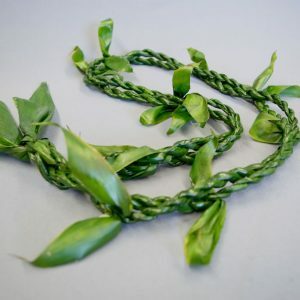 Tips of Song of India plant, braided with ti leaf, decorated with a ti-leaf rose and ferns. It's light, tough, and elegant. Song-of-India leis are colored more like the image below (the close-up). As they age and dry, they become more green. 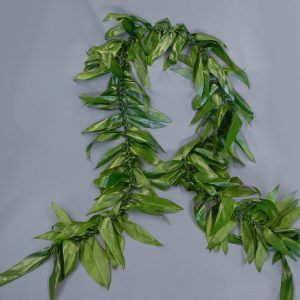 These leis may be dried to create a long-lasting keepsake.